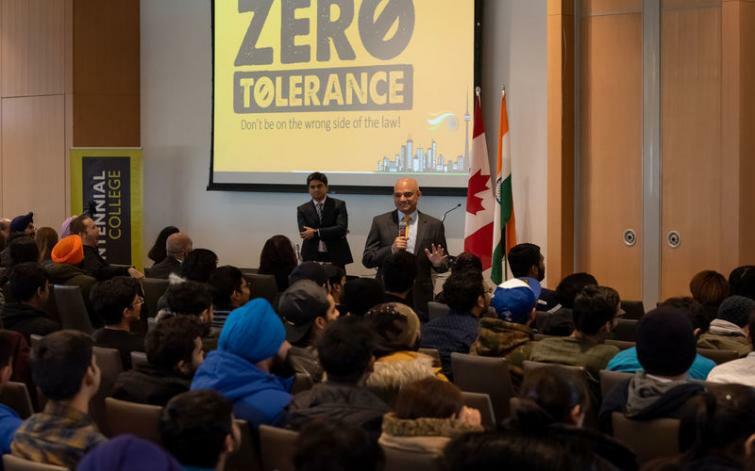 Toronto, Jan 28 (IBNS): Consulate General of India, Toronto in association with International Education Centre, Centennial College, last week organised a welcome ceremony for the international students from India at the Progress Campus of the College. This is the fourth such event in the series of welcome ceremonies that the Consulate plans to organise. The ceremony witnessed an attendance of about 1000 Indian students, 550 present and 450 on live-stream. Virginia Macchiavello, AVP, International Education Centre and Business Development, Centennial College welcomed the students to Canada and briefed them about the various settlement services that the college has for them. Jagmohan Nanda, Founding Principal, Nanda and Associate Lawyers and Vasim Sheikh, Regulated Canadian Immigration Consultant, Nanda and Associate Lawyers took the students through the immigration laws in Canada and their journey through this entire process, right from student permit to permanent residence and eventually Canadian citizenship. Consul General Dinesh Bhatia in his address while interacting with the students emphasised on the most important fact of being an 'Indian', which will always remain with them. emergency situations and introducing all the services of the Consulate General, which the students could make use of. Emphasizing the mantra given by External Affairs Minister of India, Sushma Swaraj, that Indian Mission is home away from home, he concluded by telling the students that the Consulate is just like their home away from home and they can feel free to contact the officials in any sort of emergency situation. In its endeavor to further enhance its outreach with international students from India coming to Canada, the Consulate is making concerted efforts to organise a series of such Welcome Ceremonies in the Colleges/Universities in Greater Toronto Area which garner over half of the international admissions of Indian students coming to Canada.